CARSTAR President Michael Macaluso on Thursday said the company would reach 660 shops in North America by the end of the year — with the “bulk” of the growth coming from the United States. The franchisor seeks to reach 1,000 shops across the U.S. and Canada in three years, “next year, and the years to come, looking to continually add more than 100 locations to our system,” he said on a media call celebrating CARSTAR’s 600th shop. Macaluso said “aggressive and important growth” needed to be accompanied with the “right balance of performance,” related to insurers and the company’s EDGE platform. “This is not a mission to grow at all cost,” he said. Asked about potentially expanding beyond the U.S. and Canada, as franchisor competitor Fix Auto does, Macaluso said “never say never,” but the company is tightly focused on making its North American operations the best. 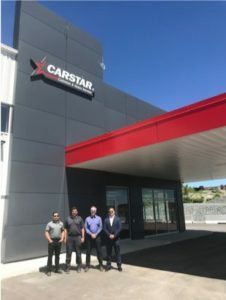 CARSTAR Canada national director of franchise development Collin Welsh said that the key to the company’s Canadian growth had been partnering with its existing franchisees for organic expansion. “They’re adding locations in key markets,” he said, and this type of growth has helped CARSTAR’s Canadian operations grow faster than if the company tried to franchise new shops. At the moment, only 20 percent of the company is regional MSOs, so “there’s a significant opportunity” for CARSTARs to expand within their markets, he said. But the company was only in around 33 or 34 states, he said, and there was a “tremendous amount” of what CARSTAR calls “‘white space'” to expand. “We have a very targeted and analytical approach to growing within new markets,” Macaluso said. He said the company solicits ideas from parties like insurers and painters to identify “solid candidates” for the CARSTAR system. We asked Macaluso about the company’s pitch to potential franchisees who could also choose to stay solo, sell the shop — or partner with either a competing franchise or a buying support group like CCG. He called CARSTAR’s insurance ties and EDGE operational platform its key differentiators. The company’s EDGE platform delivers key performance indicators insurers want but also the “right sustainability for our franchise partners,” he said. Vince Pollesel, owner of Shop 600 CARSTAR Sudbury (Autoworks) in Canada, said “brand identification and reputation” were important, and the companies were aligned in their views on quality and customer satisfaction. CARSTAR offered “incredible” technical and marketing support, he also said. “We invest heavily in our employees,” Pollesel said. The shop includes in-floor heating (crucial in their part of Canada, he said), the latest frame-straightening and measuring equipment, hoists for all repairers, and a vacuum system that includes a floor-ride system. “You name it, we’ve got it,” he said.